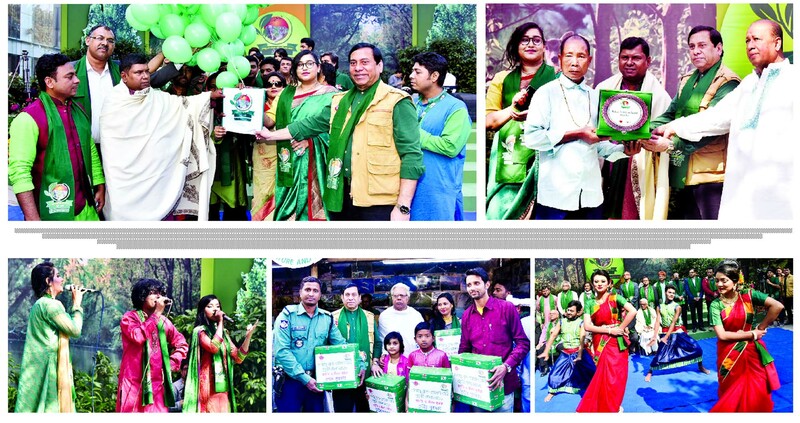 With the aim to create public awareness on various elements of environment and nature, Prokriti O Jibon Foundation, in association with Channel i, organised a day-long fair titled ‘Deshbondhu Group-Channel i Prokriti Mela’ on the Channel i premises in the city’s Tejgaon area last week. The theme of this year's fair was Sundor Prokrititey Gori Susthi Jibon. The fair was held for the seventh time and was set to kick off at 11:00am and run until 4:00pm. This year, the fair featured fancy character show, exhibition, painting competition for children, Mimo-drama, dance, pot and other folk songs like gambhira, jari gaan, pala gaan, etc. Stalls of sea-fish, butterfly exhibition, bird-related book stall, stalls of hand and cottage industries, and many other features were highlighted at the fair. Director of Channel i and Chairman of Prokriti O Jibon Foundation Mukit Majumdar Babu, Managing Director of Channel i Faridur Reza Sagar, Managing Director of Deshbandhu Group Golam Rahman, Managing Director of Noor Eco-Brics Mohammad Shahjahan Siraj were present at the inauguration, among others.